Coast Starlight No 11 cruises through Albany, pretty much on time. Under railroad laws Congress passed in 1970 and later, freight railroads must give preference to passenger trains except in emergencies or when a railroad has received approval of an exception. The transportation board published a proposed rule it said would clarify what is meant by “preference.” Rail passenger interests across the country have opposed the change, saying it would jeopardize efforts by Amtrak trains to run on time. So how are the trains stopping in Albany doing in terms of being on time? This month so far, two of the six state-supported trains in the Amtrak Cascades service have been 100 percent on time. 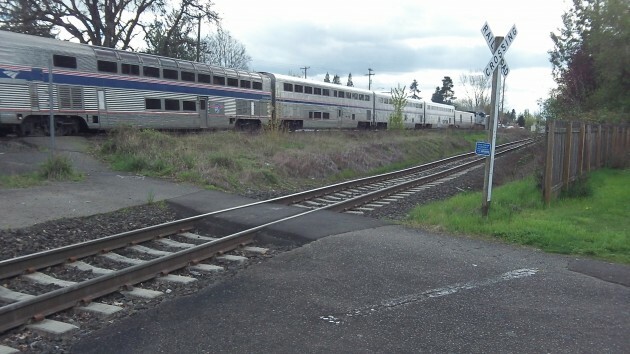 Overall, the April on-time record of all six — as determined by arrival at Portland and Eugene, not their intermediate stops, was 88.3 percent. The Coast Starlight’s record so far this month is about the same, 88.5 percent. The southbound Train No. 11 from Seattle stops in Albany at 4:10 p.m. and usually does so within a few minutes of that schedule. On Sunday it was three minutes early, and the longest it was late the other days was 14 minutes on Wednesday. The scheduled 1:22 p.m. arrival of Train 14 from Los Angeles, with far greater distance to cover and more opportunities for disruptions, has been more variable. No. 14 was 7 minutes early on Monday, but the next day it got to Albany Station six hours and 10 minutes late. The other days this week, it was late between 19 and 48 minutes. To what extent freight operations by the Union Pacific had anything to do with routine delays did not show up on the Amtrak time-check website, but they had nothing to do with the problem on April 12. That is better on time performance than the airlines, Go Amtrak! Sure wish the Cascades would stop in Woodburn, as that would save me a lot of freeway miles. I have the pleasure of taking the Amtrak to Seattle and back from the Albany station once a year. Usually uneventful which is nice. The occasionally noisy kiddo or loud adult but you get that anywhere. The key is mental state. One must prepare to display patience! All the numerous stops along the way. Add that Woodburn stop …fine by me. Again it is all about consideration for others and patience. Last year on my travels, the conductor said numerous times we were stopped for freight. Lengthy weight times I add! Four times our travels North were halted to a stop to allow BNSF freight to pass before we could resume our passage. This year (March 2016) was much smoother. Fewer stoppages and fewer annoying people! Hope I don’t scare anyone off from the rail because if you have time and PATIENCE….and uber fare it is the only way to go …to downtown Seattle. The scenery is fabulous in places too. Grab a book, relax, and enjoy a very pleasurable, stress-free journey! If you have ever been to Europe you know how great trains can be. Fast, frequent, comfortable and reasonably priced. In a few of weeks I’ll be on the Spanish AVE train which runs up to 192 MPH. It could be the same here, but it requires an investment in infrastructure. The railroads are making big money on freight and their best use of capital is to expand freight capacity, not provide passenger service. I get that. That means it’s up to government. New high speed tracks dedicated for passenger rail with 300+ MPH design capacity. We already own a lot of right of way with the interstate highway system, and nothing will get people out of their cars faster than tooling down the freeway at 70 MPH, only to be passed by a train going 200 MPH. The people of California funded a high-speed rail network by an initiative. It could happen here too. In your dreams Bob. The tracks that are capable of handling these speeds will cost many times the cost of the trains. They seem to avoid mentioning that cost. How do the more often used “AMTRAK buses” compare to “real” AMTRAK trains for on time performance? I’ve never seen an AMTRAK bus, but I have ridden an AMTRAK “Cascades” train many times. I doubt any bus would be remotely as comfortable. Every time I’ve come back from PDX around 6-7 PM., it’s been a bus. You see them all the time Ray. You know the ones that say POINT something or other?